With the advent of solar panel customization, art in public space stands ready for a revolution. Solar Mural artworks celebrate local culture, provide new opportunities for artists, and make communities more vibrant and livable, all while reducing the carbon footprint of our cities as part of the solution to climate change. In sustainable cities of the very near future, murals will be fabricated from photovoltaic panels as often as they are created with paints. The unveiling of the first LAGI Solar Mural artwork La Monarca took place on November 11th at Luminaria: Contemporary Arts Festival in San Antonio. La Monarca is the world’s first Solar Mural installation. The La Monarca image was designed by San Antonio artist Cruz Ortiz with creative direction by Penelope Boyer. La Monarca is a giant lotería card celebrating San Antonio’s status as the National Wildlife Federation’s first Monarch Butterfly Champion City. La Monarca has been a collaboration between Land Heritage Institute (LHI)’s LHI Art-Sci Projects, EPIcenter, the Local Initiatives Support Corporation (LISC), and the Land Art Generator Initiative (LAGI). Fabrication and technical support has been provided by OCI Solar Power, Mission Solar Energy, Sun Action Trackers, and Sistine Solar. The project has been made possible through support from the Alice Kleberg Reynolds Foundation, Texas Commission on the Arts, and the National Endowment for the Arts. 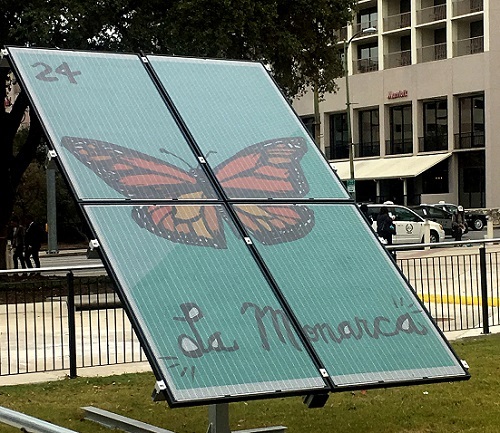 Following the close of Luminaria, La Monarca will find a permanent home inside a pollinator garden on the EPIcenter campus along the Mission Reach of the San Antonio River where it will generate solar energy that will feed directly into the building and the city power grid. In the near future, Las Monarcas will be a swarm of Monarch Butterfly-inspired Land Art Generator Initiative artworks to be designed for placement at and to provide power to social service centers, municipal buildings or eco-cultural tourism destinations in the City of San Antonio, or other stops along Monarch Butterfly migration routes. The expanded installation will be emblematic of the full range of issues the Monarch Butterfly has come to represent: species extinction due to global warming and climate change; immigrant, exile, and refugee rights; and now, renewable energy and regenerative design.